Driving a car with brake problems is very dangerous. If you experience trouble stopping, get your car towed to a repair shop. Brake pedal sinks to the floor: If there are no external leaks, yet the brake pedal goes to the floor, the master cylinder is probably leaking internally. The pedal may also feel spongy or unresponsive instead. Dragging brakes: A master cylinder that does not release fully can result in the brakes feeling like they are sticking or dragging while you drive. Fluid leaks: A cracked or damaged master cylinder bore can result in external fluid leaks. Leaks may also develop around the outlet ports, reservoir seals and bore end seal. Brake warning light: If the master cylinder is leaking, it can cause a low brake fluid level, triggering the brake warning light. Before spending time and money to replace the master cylinder, a thorough diagnosis should be performed. A professional will inspect the entire brake system checking for leaks and damage. Low brake fluid levels in the master cylinder reservoir could indicate worn brake pads. As brake pads wear, it is normal for brake fluid to be displaced to the brake calipers, causing the low levels. Problems elsewhere in the brake system can cause symptoms similar to a defective brake master cylinder, including stuck calipers and ABS valve bodies. Have the shop inspect the entire brake system to verify that the problem is specific to the master cylinder. A faulty master cylinder should be replaced a soon as possible. 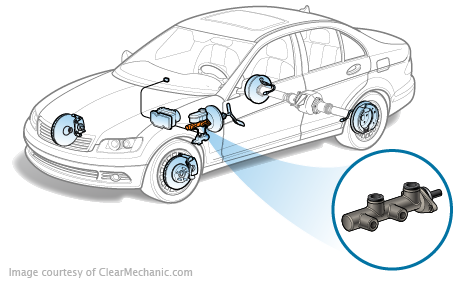 The procedure is rather involved and requires bleeding the brake system of air afterward. It should be left to a pro. Also, flushing brake fluid every two years can extend the life of your brake master cylinder. The brake master cylinder is mounted in front of the brake booster. A reservoir sits on top of the master cylinder and supplies it with brake fluid needed to make hydraulic pressure. The master cylinder has two hydraulic chambers for safety reasons. If a leak develops in one area of the brake system, the other chamber should remain functional for emergency purposes. When you apply the brakes, the booster acts on the master cylinder, pushing the pistons inside. Fluid is drawn from the cylinder’s reservoir and is pressurized. It then flows from the outlet ports on the side of the master cylinder to the brake lines. Where the fluid goes from there depends on the vehicle’s braking system. Some vehicles have four-wheel disc brakes, while others have discs in the front and drums in the back. Disc brakes: On vehicles with disc brakes, the lines go to a brake caliper at each wheel. Inside each caliper is a set of brake pads positioned around a brake rotor. Hydraulic pressure from the master cylinder causes the caliper to squeeze the pads against the rotor. Drum brakes: In a drum brake system, the lines go to the wheel cylinders. Each wheel cylinder is positioned inside a set of brake shoes, fitted inside a brake drum. Pressurized fluid from the master cylinder causes the wheel cylinders to push the shoes outward against the drums. When the brake pedal is released, fluid is forced back through the brake lines to the reservoir. How hard is it to relace a brake master cylinder without stability control?